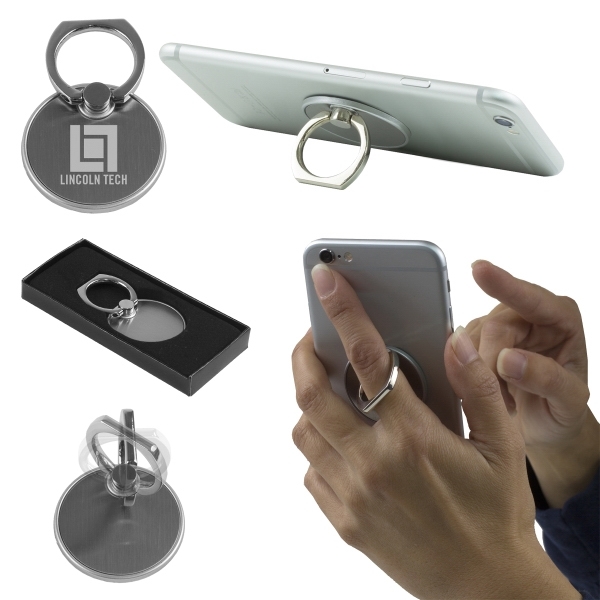 Keep a firm grip on your phone with the Twist Cell Phone Metal Ring Holder and Stand! This unique gadget enhances control of mobility with operating your phone or taking pictures. It features adhesive backing that is easily removed while leaving minimal residue, and a strong metal rotating ring that also functions as a convenient phone stand for viewing videos, playing music or reading books. The sleek silver accessory will look even more stylish once imprinted with your logo or company name. From college campuses to company meetings, this ring holder is sure to make your brand stand out! A one time set-up fee will added for imprinting.